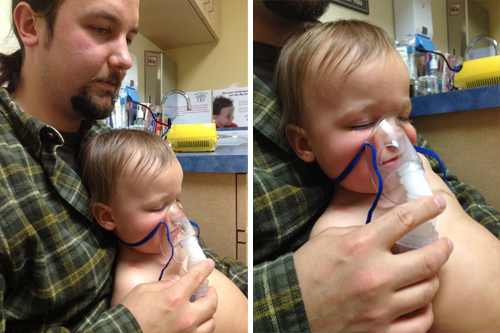 Last week, Jameson went to the doctor on Tuesday for his check up and 15 month vaccinations. He had a mild cough (mostly when he was sleeping) but otherwise seemed pretty healthy. In the days that followed, he developed low-grade (99F) fevers in the afternoons at daycare which we had them treat with Advil and which it responded to. I guessed it was the vaccines or teething. We weren’t too concerned, but his cough was worsening, and finally on Friday his fever jumped to 101F late in the afternoon. We called the doctor then, but they recommended it was viral and not to come in unless it got worse. I can’t say that it got significantly worse, but Jameson had reduced appetite and we had seen a sign on his daycare door warning of croup, so on Saturday we opted to go in to the doctors office anyway. I hadn’t even showered yet, it being a lazy Saturday morning. I left the doctors office with Jameson in an ambulance. The doctor, who was not our regular pediatrician but part of the practice we go to, determined that he had pneumonia based on the sounds in his left lung and fevers. 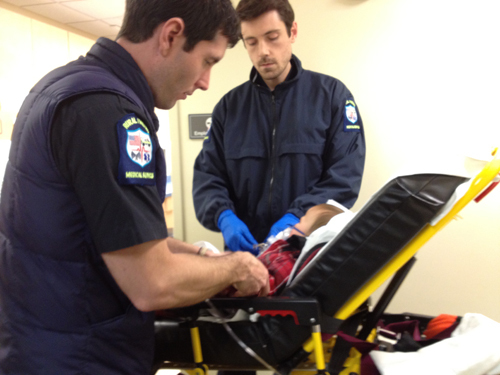 They measured the oxygen in his blood with pulse oximtery and decided that we should do a breathing treatment. His levels were lower, but not dangerously low. The treatment is typically used for asthmatics and help open the airways. Jameson was not a fan. He was already exhausted since he hadn’t had a nap, so thankfully he only fought for five minutes or so before giving in to the mask and loud buzz of the machine. 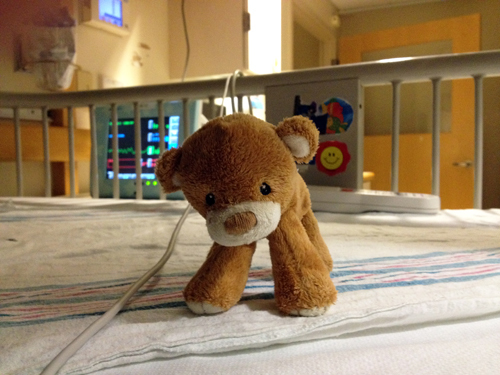 Unfortunately for Jameson, it didn’t really help oxygenate his blood, and in fact his next pulse ox measurements were lower. We did one more breathing treatment which raised it one point. Jameson was near to falling asleep during the second round, poor thing. The cut off, the doctor told me, is 93. Normal adults are between 96-98 he said. Our regular pediatrician told me later that everyone has their own cut off. But regardless, Jameson was at a 92. And I kind of thought maybe I saw some skin darkening at the fingers and toes, so I was starting to get concerned. 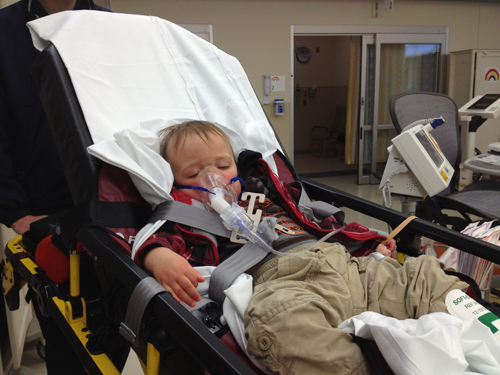 At that point, the doctor recommended oxygen for Jameson and transportation to the hospital. Once attached to oxygen, we couldn’t very well transport him ourselves. We agreed. 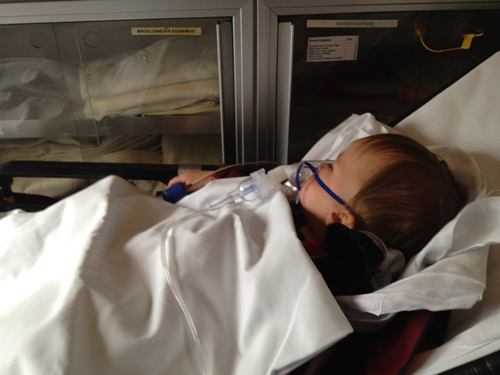 And once he was on oxygen, Jameson measured 98 and 99, which told us we had made the right decision for him. Were I to go through this again, I would bring my own Tylenol or Advil with me. Jameson measured a temperature of 99 when we arrived at the doctor’s office and we hadn’t given him anything yet, but by the time we were admitted and settled some 4 hours or so later, Jameson’s fever reached 102 because of the delay. I rode in the ambulance (no sirens or lights, as this was an non-emergency transport; Jameson was stable and actually sleeping), while Brian went home to grab some things. The pediatrician couldn’t give us an estimate as to how long Jameson would be in the hospital with pneumonia. It was somewhere around the afternoon when we were finally settled. Jameson was extremely unhappy about the new nose tubes for oxygen (they didn’t go all the way in, just rested at his nostrils). It took us a few tries. Jameson kicked me in the throat and completely tore it out on our first try. Once it was in though, he pretty much gave up. 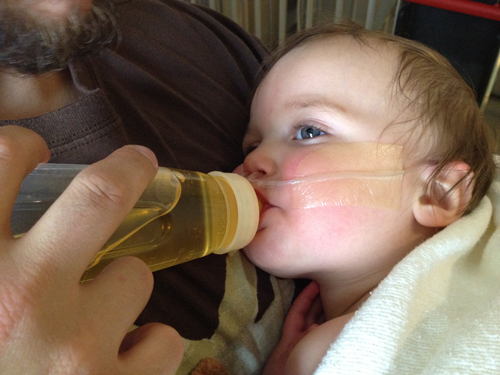 Jameson received Motrin and apple juice/water. He wasn’t interested in milk at all, but downed the apple juice. We felt some relief shortly after as the doctors weren’t convinced he had pneumonia; they said his chest sounded clear except just a little something near the bottom on the left. But they brought an xray machine into our room to check his lungs anyway. Pneumonia aside, Jameson was really tired and not feeling well, so he laid on us most of the day. 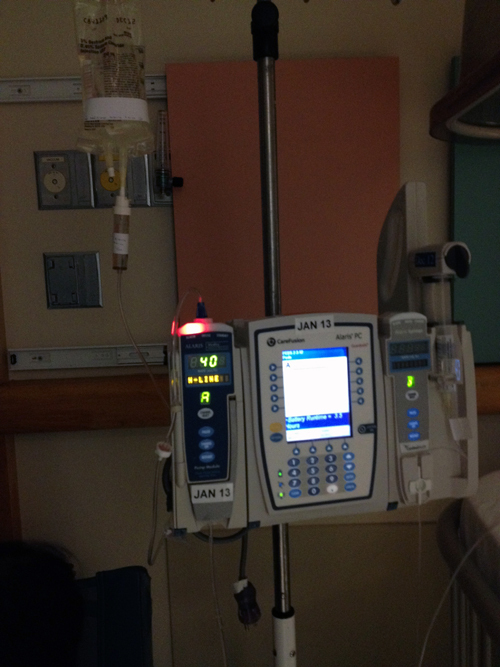 After a few hours, we determined that Jameson was probably dehydrated and so they inserted an IV and gave him fluids. I didn’t watch, but Brian said that he cried until the initial poke and then he just watched them work. Like father, like son! They took some blood for analysis then too. Along with fluids, they gave Jameson a dose of antibiotics via IV since he may or may not have pneumonia but he definitely had an ear infection. Later in the evening, they told us that Jameson’s xray “looked clear” (though it hadn’t been officially signed off on just yet). No pneumonia! And blood work was all normal too. As a bonus to all this, since Jameson got his round of IV antibiotics, he didn’t need to come home with any oral antibiotics. Once and done when you’re in the hospital! Jameson’s fever hadn’t broken yet by 7 that evening, so we opted for Tylenol which did the job overnight. And that was Saturday. Phew! Brian left late at night to go home and check on Sasha (many thanks to our neighbors who paid for Brian’s oil change and fed and let her out during our stay at the hospital). Meanwhile, I am a little bonier than Brian (read: less comfortable) so Jameson had a hard time getting comfortable on me. Every time he fell asleep, I felt like one of our’s or our roommate’s monitors were going off. Around 3 am, the nurse said he had been weaned off the oxygen, so we unhooked him, and I was able to lay down (FINALLY) with him on the couch/futon. We fell asleep around 4:30. Brian arrived bright and early Sunday morning to us laying there on the futon, Jameson on my chest sleeping soundly. But… we didn’t get to go home on Sunday. 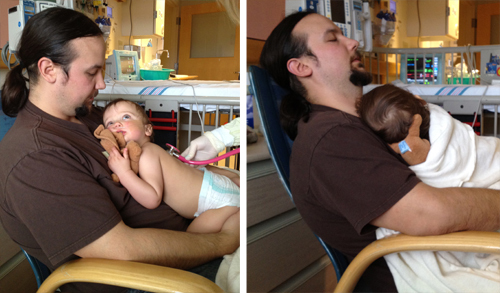 Despite the fact that Jameson was feeling much better, with fever broken and antibiotics and fluids in his system. He wasn’t a big fan of confinement, I’ll say. In some ways, Sunday was worse than Saturday. And we were still waiting to find out what he had. Poor guy! Glad you’re all back home! For a bit of reassurance, I apparently had a hospital visit where I was all hooked up to IVs and stuff when I was not much older than Jameson, and I don’t remember it at all.